In the midst of all the uncertainties in my childhood, there was one thing I was sure of: every Saturday at 10:00 am, on the dot, our doorbell would ring. And, unfailingly, the opened front gate would reveal a tiny old lady hawker, Pa (“Auntie”) On, who always had on her face a huge grin that unveiled betel-stained teeth speckled with gold fillings and on her shoulder a bamboo stick on which two baskets full of traditional Thai desserts hung. With its inhabitants always fully committed to buying enough of her various steamed treats in banana leaf packets to last them a week at a time, Pa On never had to wonder if she’d make a sale at this house. The moment she set her baskets down at the front gate, she knew someone would come out with a wallet and she would depart with her baskets weighing about half of what they did when she’d arrived. This house was her Destination Unload Point. I was glad that was the case. You should have seen how small Pa On was and how huge and heavy those baskets were. On the day Pa On didn’t ring the doorbell, we waited and waited only to learn later that she’d been fatally hit by a motorcyclist just a couple of blocks from our house. I can’t recall how exactly our household responded to the news, but I remember being angry. I wasn’t angry at the motorcyclist (though I should have been). I wasn’t angry at fate. For darn sure, I wasn’t angry that our best, most reliable source of treats was gone; there were other vendors. At the age of eight when the incident happened, I was too young to think along those lines. I was angry at myself. I was angry at us. I was angry at the whole neighborhood. Irrational as it may seem now, this made sense to me at that time: I kept thinking that if people had bought more of her desserts that day, her baskets wouldn’t have been heavy and the frail woman would not have wobbled into the path of that reckless motorcyclist. I kept thinking that if people had bought all of her desserts prior to that point, she would have been done for the day and gone home early with two empty baskets instead of lying on the side of the road like she did when they found her. Well, the frustration didn’t last that long; the yearning for good-quality Thai desserts, on the other hand, has stayed with me. 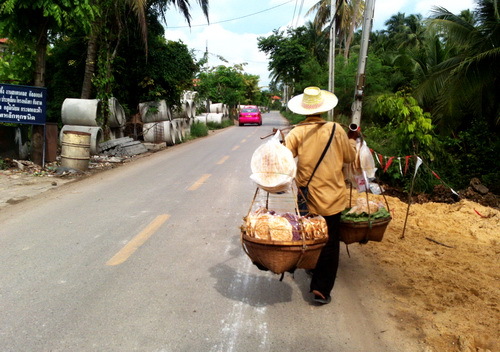 Khanom Tan (ขนมตาล) was one of Pa On’s prides. 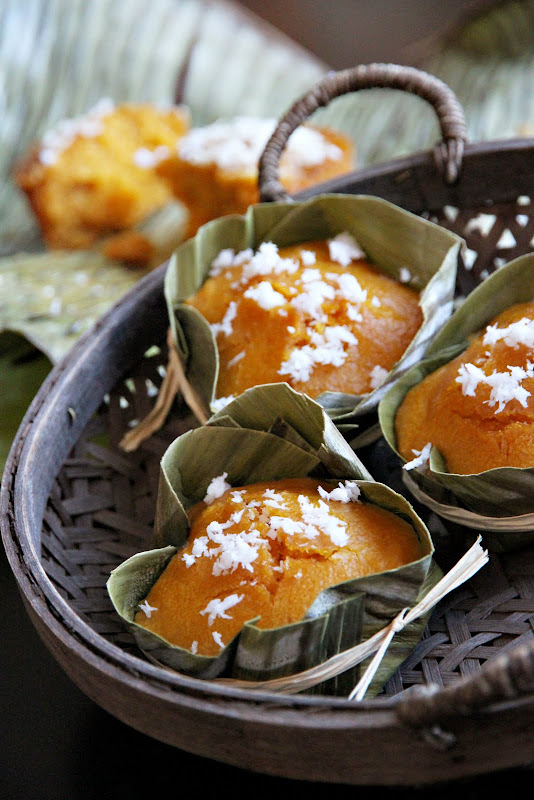 The dessert is made of rice flour, fresh pulp of toddy palms (or sugar palms), coconut milk, and sugar. 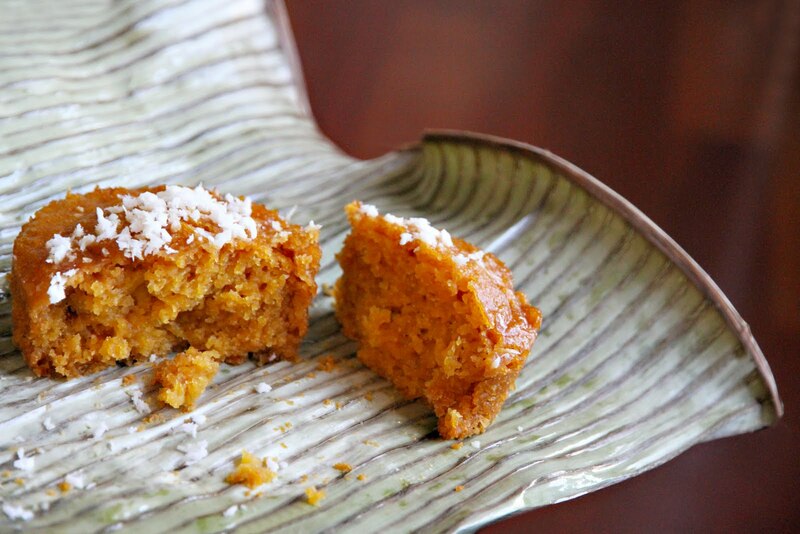 Traditionally, no leavening agent is used; the natural yeast present in the pulp of toddy palms, Saccharomyces exiguus (Candida holmii or Torulopsis holmii), is what gives rise to this steamed cake resulting in a light, fluffy texture similar to South Indian idli. The prepared batter is left to ferment in the sun for a few hours to allow the natural yeast to do its thing. This is one of those desserts that cannot be rushed. Skip this step and your toddy palm treats are tough, dense, and devoid of the trademark “yeasty smell” unique to this much-loved traditional Thai dessert. Once the batter has risen, it is spooned into a banana leaf packet like this or this, topped with grated fresh coconut, then steamed. These days, they’re often steamed open-faced in banana leaf cups or in small heat-proof ceramic cups. In this case, I use pumpkin purée instead of toddy palm pulp as I figured most of us don’t have access to fresh toddy palms. The consistency of pumpkin or squash purée is identical to that of strained toddy palm pulp; the taste is also close enough. Unfortunately, pumpkin or squash purée does not come with the type of wild yeasts we need. 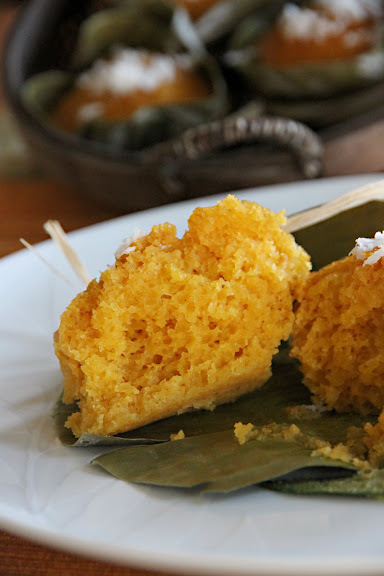 [I have made little steamed squash cakes similar to this once before, and realized that even though the end product was good, it lacked the texture of khanom tan which I wanted to mimic.] Dry yeast and baking soda are used to create the effects traditionally achieved by those little critters. Combine the starter ingredients together in a large mixing bowl; let the mixture sit for about 20 minutes, uncovered, in a warm place. Once the starter is bubbly, whisk in the batter ingredients, except baking soda. Cover the mixing bowl with a piece of plastic wrap. Let the mixture rise in a warm place for 4-5 hours. You know the batter is ready when it has doubled in volume and is bubbly. Alternatively, the batter can be left to rise, covered, in the refrigerator overnight. While waiting for the batter to rise, prepare your steaming vessels of choice. You can do what I did here which is lining six 8-ounce ramekins each with one 5-inch round of banana leaf, making 3-4 pleats to make the banana leaf rounds fit into the ramekin bottoms more easily. 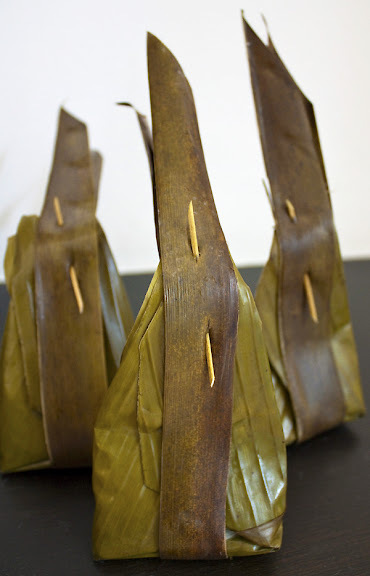 I do this, because I love the tea-like scent that steamed banana leaves impart to the cake, but you can simply grease the ramekins with oil or butter and steam the batter right in them without the banana leaf cups. Once the batter is ready, prepare the steamer. We want the water to boil furiously and remain so for the entire duration of the steaming process. Once the steamer is ready to go, whisk the baking soda into the batter. Spoon the batter into the prepared ramekins, top the cakes with grated coconut, and steam them until they pass the toothpick test. The amount of time varies depending on your steamer. Let the cakes cool before serving. Oh gosh, what a bittersweet and sad story, but a rich memory. These are a seemingly wonderful tribute to Pa On. Hi, Leela. I try to consume as little sugar as possible. Obviously, yeast needs sugar to work, but does it only need the 2 grams in the starter, or does it also need the 128 grams in the batter? If it actually needs something in between, where would you estimate? If I can replace some or all of those 128 grams with stevia, I’d be very happy. Joel – Yikes. Can’t say I have any experience baking or testing recipes with sugar substitutes. If you replace half of the sugar with some stevia, I think there’ll still be enough to get the fermentation we want. Not sure if you can replace all of it with stevia and achieve the same result. Regardless, whenever you remove sugar from a recipe, there’ll be some moisture loss. The question is, how and with what do you replace that amount of moisture? Would you like to experiment with this and let us know how it goes? The yeast don’t actually “need” anything more than the carbohydrates in the flour, and the pumpkin puree also contains oodles of yeast-friendly sugars. This batter probably contains enough sugar to actually slow down yeast growth a bit (not a problem in any way, and common; lots of sugar just holds onto water, keeps it away from the yeast, and slows things down a bit). What you’ll be losing by using stevia is texture — they’ll likely not be as moist though, with the water-holding, moistness-granting qualities of the pumpkin and the steaming going on here, that’s going to be less of an issue than for most baked goods. For those that cook by volume instead of weight I did a rough conversation. I hope this helps! Looks delicious and delicious too. A great combination with a glass of soft drinks. Such a perfect snack. Thanks for sharing. I am making this at the moment… i refridgerated the batterovernight and it still hasn’t risen. also is the batter supposed to be watery? Roughly how many minutes did you steam for? Thanks in advance! Hannah – Assuming the yeast is not too old, I would take the batter out of the fridge, dissolve a teaspoon of dried yeast in a tablespoon of lukewarm water and add that to the mixture. The batter shouldn’t be watery, though (which leads me to question whether the yeast is old). It should be similar to pancakethe batter. You may want to add a bit more flour to it to get the pancake batter consistency, check whether the yeast works, and see how it goes. Hannah – More info: the key thing, I think, is to make sure the batter is brought to pancake batter consistency. If it turns out the yeast is not working, no worries; just add 4g of baking powder to the batter the same time you add the baking soda. That should at least create the desired texture. As far as how long to steam, it depends on a lot of factors. When I steam mine In 6- or 8-ounce ceramic ramekins in a 2-tier steamer, it takes about 20-25 minutes. The key is the toothpick test. When you stick a toothpick or the tip of a bambook skewer into the center, it should come out clean. What a beautiful story, and they look absolutely delicious! Leela… I have a large jar of toddy palm paste. Will that work? And, do I simply leave out the yeast, or do the directions change completely? Cheryl – I’m a bit apprehensive in saying anything. But having seen some commercial toddy palm pulp, my instinct says it is interchangeable with pumpkin. What I don’t know, though, is whether or not the natural yeasts have died in the manufacturing process. I would err on the side of following the recipe exactly, adding the yeast as if you were working with pumpkin. Curious to know how it turns out. Will you let me know? Thanks, Cheryl. It worked!!!! OMG… I don’t think I’ve ever had such a light, delicate, fluffy thing in all my life! I did as you suggested and made the recipe exactly as written with the yeast. I ended up having to make 2 batches because with the first batch, I absentmindedly added the baking soda to the second mixture (I had just come home from happy hour!) So, I made another batch, sans baking soda, and let them both rise in the fridge overnight. I even bought some really cute ceramic cups (like yours, only all white). Both batches came out just fine. The one that I added baking soda to too early was a little more soupy than the other one after being mixed, but the taste and texture seemed to be identical with both batches. Love this recipe. I have some pumpkin puree too, and I thing I’ll try the steamed squash recipe with that one. Cheryl – So glad to hear. I need to find toddy palm paste in my area and follow your lead. Thanks for the report! Cheryl – And, yes, photos would be nice. If you can link to a page on flickr (or a similar platform) from the comment, that would be very helpful to other people reading this post. Thanks, Cheryl.